An American yankee in Canada: Got Hair? 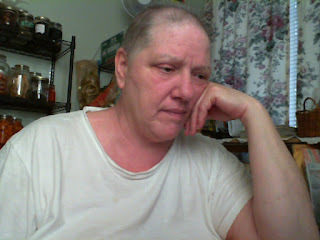 Here I am status post chemo and radiation treatments. My hair is just now starting to grow back in. Wondering if it's going to be curly or, straight is the big question in my mind. You see it used to be curly. I so wanted straight hair all my life. Anyone want to place a bet what it will be? Have to add.... after yesterday's post, I needed to write about something lighter and less emotional. Boy I look tired in this picture.